Ramanujam's research interests include optical spectroscopy, optical sectioning microscopy and molecular imaging. Her research group is developing and applying these optically based tools for the non-invasive characterization of the molecular, biochemical and structural properties of human tissues with the intent of improving cancer care. Dr. Ramanujam’s interests in the field of biophotonics are centered on research and technology development for applications to cancer. She is developing novel quantitative optical sensing and imaging tools for translational applications in cancer research. She has been leading a multi-disciplinary effort to translate these technologies into pre-clinical models and cancer patients in the areas of breast, head and neck and cervical cancers. Another important aspect of her work in this area is the design and development of cost-effective and portable illumination and detection strategies with applications to global health. In addition to her academic efforts, she has spun out a company, Zenalux to commercialize several of the technologies developed in her lab. Dr. Ramanujam has received several awards for her work in cancer research and technology development. She received the TR100 Young Innovator Award from MIT in 2003, a $2.5M DOD Era of Hope Scholar award in 2004, the Global Indus Technovator award from MIT in 2005 and a $3M Era of Hope Research Scholar award in 2009. Dr. Ramanujam was recently elected as fellow of OSA and she has been invited to be a member of the DOD’s breast cancer research program (BCRP) integration panel (IP) that sets the vision of the BCRP program and plans the dissemination of over $100 M of funds for breast cancer research annually. She is a co-editor for the latest edition of the Handbook of Biomedical Optics (publisher Taylor and Francis). In 2011, she received the Stansell Family Distinguished Research Award from the Pratt School of Engineering at Duke University. 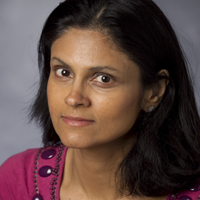 Dr. Ramanujam earned her Ph.D. in Biomedical Engineering from the University of Texas, Austin in 1995 and then trained as an NIH postdoctoral fellow at the University of Pennsylvania from 1996-2000. Prior to her tenure at Duke, she was an assistant professor in the Dept. Biomedical Engineering at the University of Wisconsin, Madison from 2000-2005. Smart Optical Sensor for Detection of Cervical Cancer In the Developing World, National Institutes of Health, 1R21CA162747-01. A Novel Optical Spectral Imaging System for Rapid Imaging of Breast Tumor Margins, National Institutes of Health, 1R01-EB011574-01. Harnessing the power of light to see and treat breast cancer, United States Army Medical Research and Materiel Command, W81XWH-09-1-0410. Biosensor Biocompatibility, National Institutes of Health, 2R01-DK-54932. Fast Spectral Imaging Device for Tumor Margin Mapping, National Institutes of Health, 2R42CA128160-02. Can Optical Spectroscopy Predict Early Treatment Response in Solid Tumors, National Cancer Institute, 5K99CA140783-02. A smart fiber optic sensor for in vivo tissue optical spectroscopy, National Institutes of Health, 1R03EB012210-01. A Fluorescence Histology System for In Vivo Breast Tumor Margin Assessment, National Institutes of Health, 1R21CA159936-01. Use of Diffuse Reflectance Spectroscopy to Assess Tumor Biomarkers that predict outcomes in Head and Neck Cancer Therapy, Duke University. Is high glucose uptake at target for early detection and prevention of triple-negative breast cancer?, Susan G. Komen Breast Cancer Foundation. Optical Assay System for Intra Operative Assessment of Tumor Margins, 7952704. Methods, Systems and Computer Program Products for Optimization of Probes for Spectroscopic Measurement in Turbid Media, 7835786. Monte carlo based model of fluorescence in turbid media and methods and systems for using same to determine intrinsic fluorescence of turbid media, 7818154. Optical Assay System for Intra Operative Assessment of Tumor Margins, 7751039. Method for extraction of optical properties from diffuse reflectance spectra, 7,570,988 B2. Depth-resolved reflectance instrument and method for its use, 7440659. Method for probabilistically classifying tissue in vitro and in vivo using fluorescence spectroscopy, 7236815. Depth-resolved fluorescence instrument with angled excitation, 7202947. Diagnostic method and apparatus for cervical squamous intraepithelial lesions in vitro and in vivo using fluorescence spectroscopy, 7202947. Spectroscopic detection of cervical pre-cancer using radial basis function networks, 6135965. Spectroscopic method and apparatus for optically detecting abnormal mammalian epithelial tissue, 6095982. Near-infrared raman spectroscopy for in vitro and in vivo detection of cervical precancers, 5991653. Optical method and apparatus for the diagnosis of cervical precancers using raman and fluorescence spectroscopies, 5697373. Diagnosis of dysplasia using laser induced fluorescence, 5623932. Diagnosis of dysplasia using laser induced fluorescence, 5421339. Integrated miniaturized fiber optic probe, 8369915.